"You're the first people I've seen. You're the first people… who are still people." The first Australian trailer has debuted for a dramatic horror thriller titled Cargo, from directors Ben Howling and Yolanda Ramke. Even though this seems like a horror comedy, it's actually more of an intense thriller. Martin Freeman stars as a father trying to save his child at all costs in a post-apocalyptic world. The film's full cast includes Anthony Hayes, Susie Porter, Caren Pistorius, Kris McQuade, Natasha Wanganeen, Bruce R. Carter, Simone Landers, and David Gulpilil. As wacky as the pitch for this might seem, it looks like an engaging, suspenseful zombie flick. I'm also glad this trailer isn't from America, because they would never allow this much blood, but it's just naturally a part of the movie so it's all over the footage, of course. Enjoy. Cargo is a post apocalyptic thriller and an emotional story of a father trying to save his child at all costs. Stranded in rural Australia in the aftermath of a violent pandemic, an infected father desperately searches for a new home for his infant child and a means to protect her from his own changing nature. 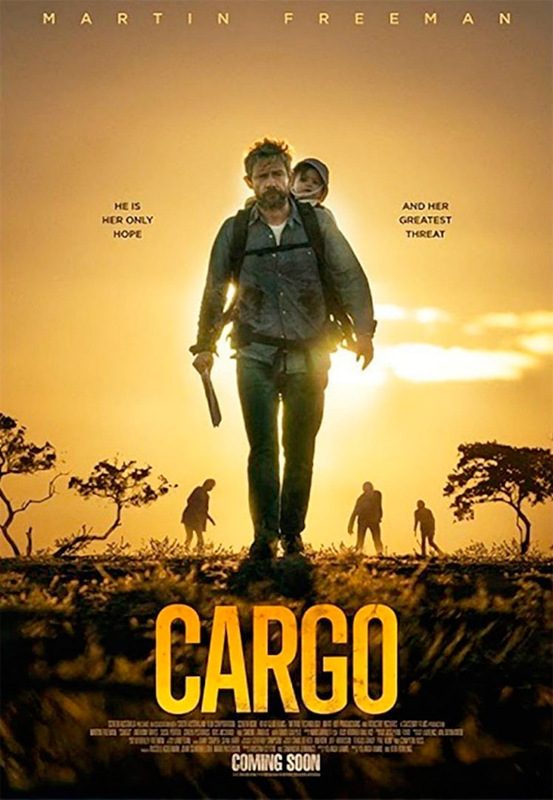 Cargo is co-directed by filmmakers Ben Howling and Yolanda Ramke, both making their feature directorial debut after a few short films and other production work previously. The screenplay is written by Yolanda Ramke. This first premiered at the Adelaide Film Festival last year. The film is currently set for release in Australia starting May 17th, but does not have any US release yet. Stay tuned for updates. Who's interested already?